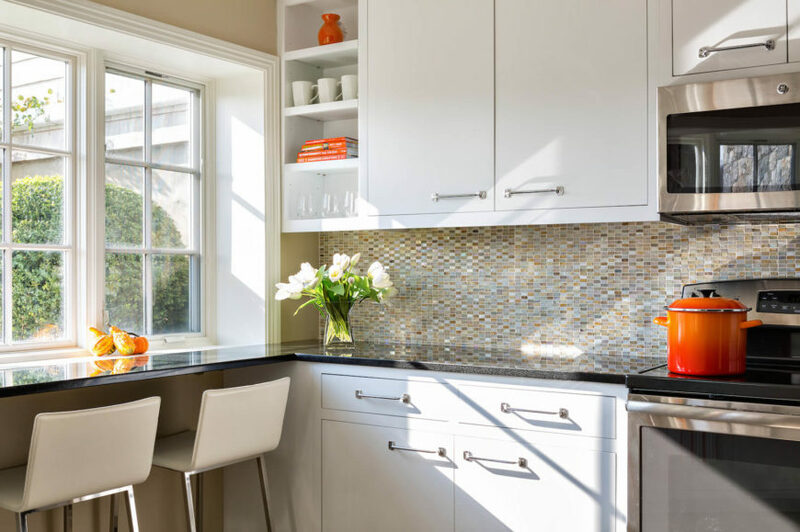 Welcome to our gallery featuring beautiful and colorful interior designs by Clean Design, based in Westchester County, New York. The crown jewels of this home in Bedford Hills are the master suite and the family room. The master suite was designed for a client who wanted a comfortable place to relax after a long day. The client wanted a soothing environment that didn’t solely rely on a neutral palette. The solution was to make the wall color a rich gray-green with accents of mint and taupe to bring a balance of soothing neutrals and contemporary colors. Adding to the charm of the master suite is the unique and eclectic collection of furniture that ties the sleeping and sitting areas together. The family room was another place where the client wanted color amidst neutrals: bold, but not too bright; neutral, but not too boring. The larger furniture pieces were kept neutral so that the turquoise and berry accent colors could really pop. The result is a funky, bright room that welcomes every occupant of the home. We hope you’ll love this bright, contemporary home which illustrates that when you combine neutrals with fun and whimsical colors you can create interesting and livable spaces. The living room features patterned chairs, a pale gray cotton sateen on the loveseat, and a dusky gray velvet on the sofa. Above the stone fireplace is a wall-mounted television. Artwork in the room includes bright, abstract paintings, a black and white drawing, and a modern interpretation of Elvis. Turquoise and berry accents give this room a boost of bold color. 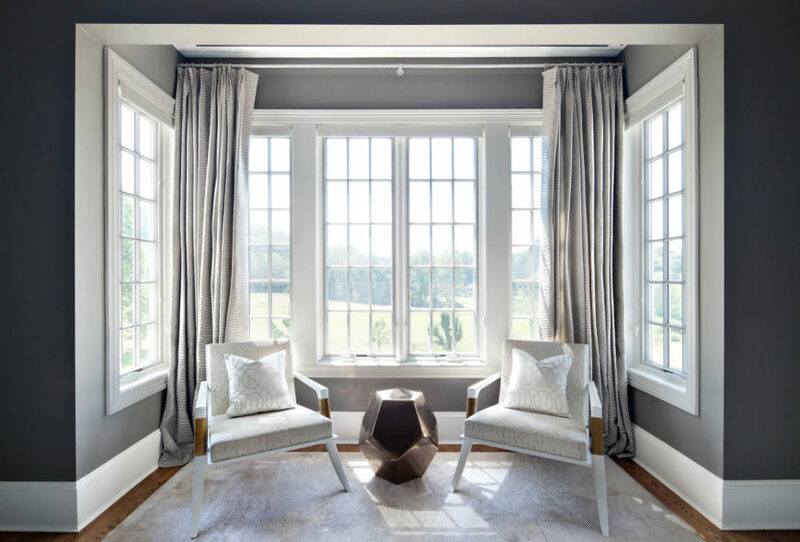 A closer look at the seating area in the bay window alcove shows two chairs upholstered in a white and berry Ikat fabric. Between the two chairs is a modern metal side table. The bold turquoise drapes behind the chairs is a playful color statement. This shot of the living room showcases the stone fireplace and the built-in bookcases that flank it. The striped charcoal gray rug and the pale gray, cerused oak coffee table allow the turquoise and berry accents scattered throughout the room to sing. A close up shot of the modern shelving unit near the entrance to the room, shows books and eclectic, decorative elements. 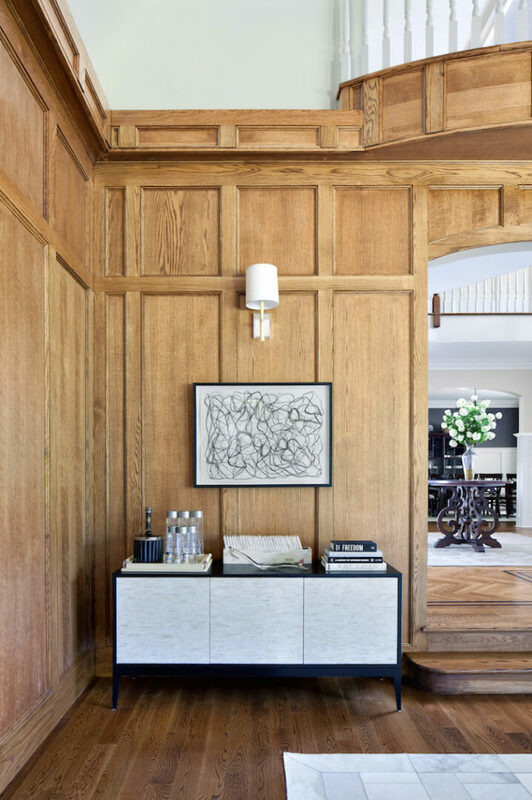 A console table with a pair of hide-covered x-benches sits on the other side of the archway from the shelving unit. Above the console table is a mirror in ivory shagreen. The table lamp is made of a beautiful, bold turquoise glass. The master suite has a delicate, light color palette with a rich, gray-green wall color and mint accents. Bolder, yet still elegant colors are brought into the room with the two paintings above the head board. Through the archway on the left is the adjoining sitting room. A view of the left side of the master bedroom peeks into the sitting room. It shows a glittering capiz shell mirror above an ivory and espresso dresser with lucite accents. A glass vase with tulips on one end complements the green swirls of the murano glass table lamp on the other end of the dresser. Soft accents of mint are brought in by the throw pillows on the bed. A small seating area in the bay windows of the master suite. The contemporary chairs are matched with a metallic side table in bronze. The subtle, striped curtains behind the seating area add dimension to the room by bringing in some pattern. A small nook on the right side of the room is home to a modern-style dresser in a darker wood. The mint from the bed pillows is repeated in the mint pottery on the dresser and the watery hues of the oil painting above the dresser. The sitting room adjacent to the master suite has two cozy, hair-on-hide chairs, a beige linen sofa, and a beautiful button-tufted upholstered ottoman. A metallic tray on top allows the ottoman to double as a coffee table. On the far wall is a gas fireplace, black and white contemporary artwork, and built-in shelving. 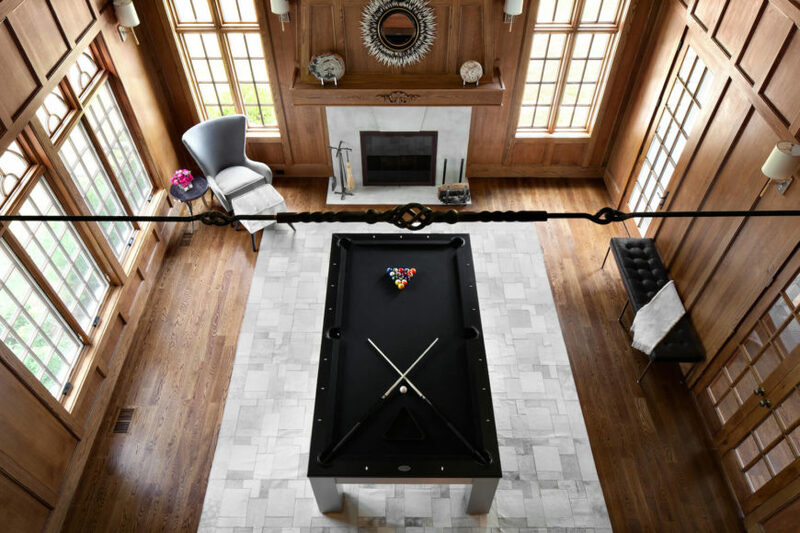 The main spot for guests in this home is the formal living room which was turned into a billiards room. A series of beautiful, large windows allows in plenty of natural light. A custom-made, patchwork hide rug adds texture and dimension to the space while playing off the masculine, wood paneling. On the far wall between two windows is a large-scale fireplace clad in white marble. An aerial view of the living room, shows a small seating area next to the fireplace and a bench on the right wall. The living room entrance is off of the foyer, and immediately to the right of the entrance is a small buffet area with a stunning piece of contemporary art. Visible through the archway is the ornate dark wood table with a vase of white hydrangeas that brightens the foyer. On the left when you enter the living room room is another small seating area with two chairs coupled with a series of contemporary photographs. Visible to the left of the frame is the staircase in the foyer. This kitchen is actually the secondary kitchen in the home. It is located in the basement and is a triangular shape. Due to its open design, most of the room enjoys natural light from the two large windows. A unique feature is the breakfast bar in front of the window. 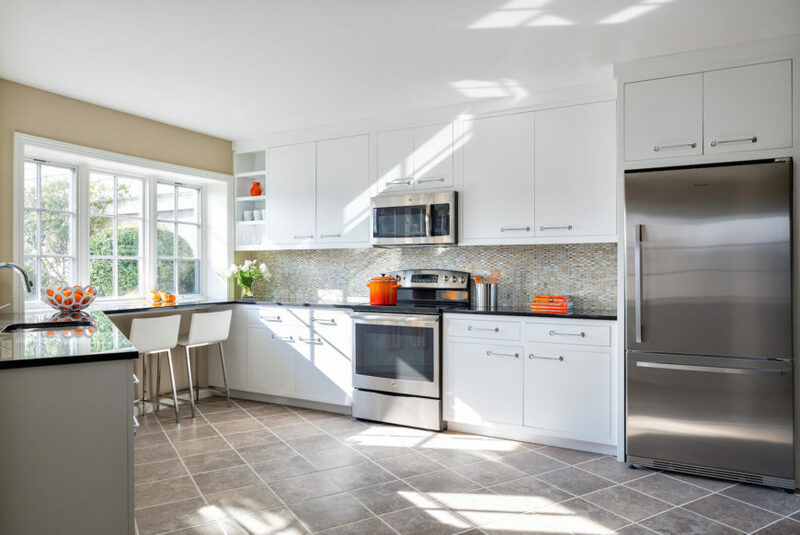 The airy, lower-level kitchen is situated in an interesting section of the home that narrows towards the breakfast bar, taking the concept of “kitchen triangle” to a whole new level. 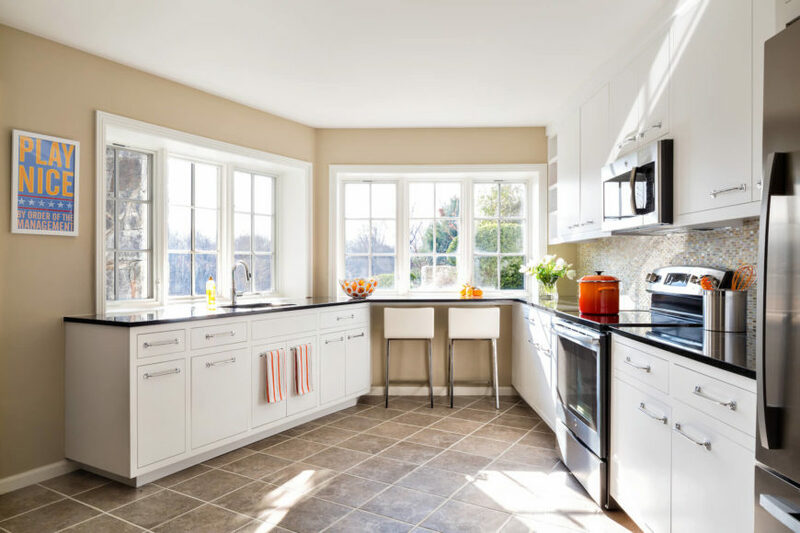 The high end appliances and white cabinets give this kitchen a feeling of perfection. A close up of the breakfast bar facing the window and the beautiful multi-toned glass backsplash. Open shelving on the left is the perfect place to display accents. 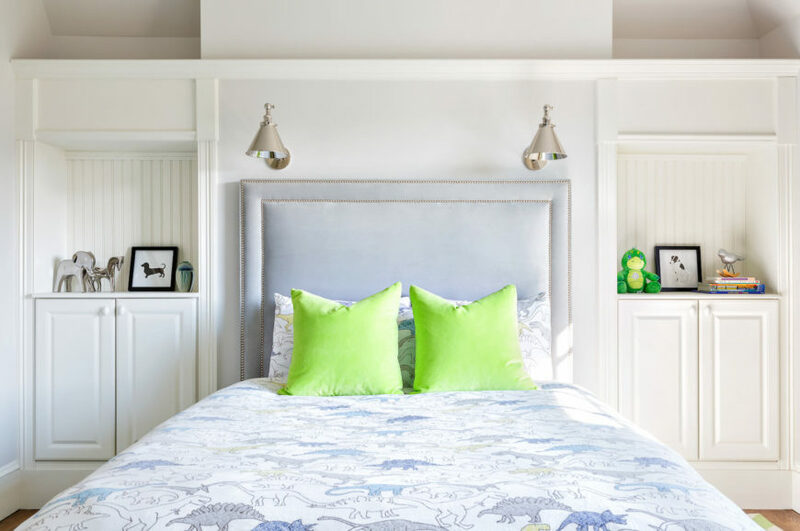 A child’s bedroom in white and green features a fun, dinosaur duvet cover. 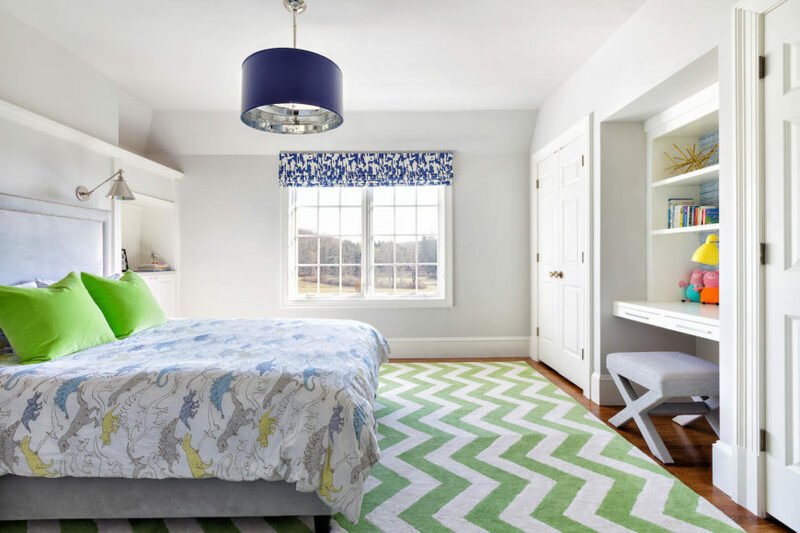 The area rug is a chevron pattern in a spring green and white. The secondary accent color is a bright, deep blue: prominently used in the light fixture, on the wallpaper behind the built-in desk, and on the roman shades. 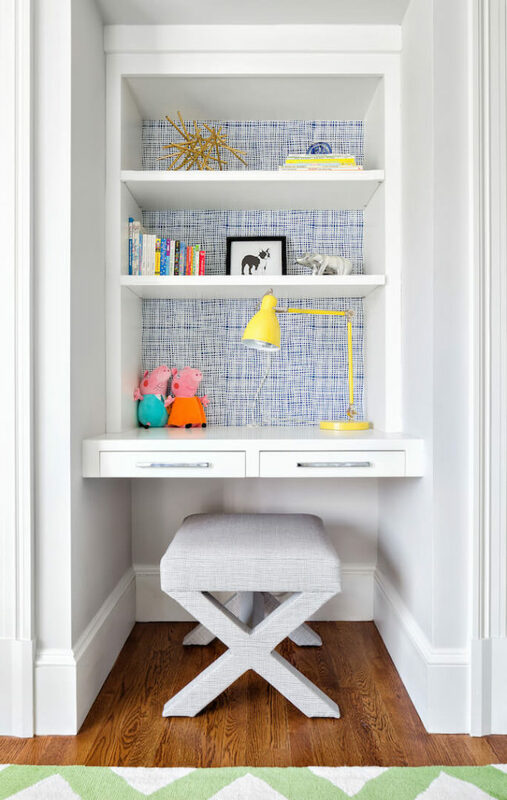 The desk in this children’s room has a small upholstered stool that can be swapped out for a larger seat as the child grows. The back of the built-in desk is a blue and white “cheesecloth” patterned wallpaper that adds a fun accent behind the bookshelves. A final look at the adorable dinosaur bedding that is brightened up by neon green throw pillows. The built-in shelves and reading lights on either side of the upholstered head board eliminate the need for nightstands.